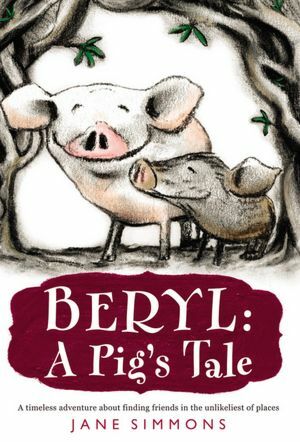 Beryl: A Pig’s Tale begins in a commercial warehouse, where all the pigs live together in concrete sties. Beryl is an orphan, living with her aunt and cousins who all hate her. One of the workers comes around, putting stickers on the biggest piglets. Everyone knows this means the piglets will be leaving and not coming back, so Beryl’s aunt tears the sticker off her son and sticks it on Beryl. Convinced the outside world must be better than wherever that truck is taking her, Beryl seizes a chance to escape. Soon she meets Amber, a wild piglet, and after getting over their own prejudices, they become fast friends. Amber’s aunt and uncle, to make up for previous oversights, side with Beryl even when the settlement of wild pigs turns her out. The pigs set out in search of a new home and encounter many adventures along the way. Overall it’s a sweet story of friendship and acceptance, and the charcoal sketches throughout are charming. (The author also wrote and illustrated one of our favorite picture books, Come Along, Daisy! .) My daughter loved this book, and she identified with the pigs enough that she’s now going through her first vegetarian stage (if she’s like me, this will be something she does from time to time. But who knows? Maybe for her it will stick). Family is what you make of it. On the dysfunctional side, Beryl’s aunt and cousins are awful to her. Some of the wild pigs are awful, too, turning out members of the community who don’t follow the rules. Dew’s mother loves her but is rather overbearing, to the point of giving Dew a bit of a complex. 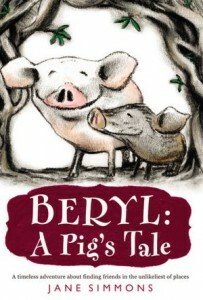 On the healthier side, Beryl finds family among the wild pigs who accept her for who she is. Amber’s aunt and uncle are loving and wonderful. Long lost parents hold out hope of being reunited with their kids and other loved ones. Dew finally stands up to her mother, and it seems like their relationship improves. A major theme through the book is fear of Other—the pink pigs fear the wild pigs and the outside world; the wild pigs fear all non-pigs, bears, and “lost” pigs. There’s a lot of needing to overcome fear to get the help you need. Horrible things are done in the name of prejudice and all good things come from looking past your fear. For instance, when the pigs have to depend on the bears for guidance, they finally realize that they’ve never actually heard of any pigs being eaten by bears. The home they find in the end is one where lots of different kinds of animals live together. The scene where a worker with an electric zapper drives Beryl out of her sty and into the truck by is pretty intense. Then she goes through lots of scary adventures including a truck accident, being chased by wolves, rescuing a piglet from a raging river, etc. Being a pig isn’t an easy or safe life. Beryl’s mother died when she was born, and her motherless state is a pretty major part of her identity. She bonds with other motherless animals. It’s assumed that all pigs who leave the sty are killed, and in nearly every case that’s certainly true. There’s one tragic death that honestly I thought was a low blow. Amber is reunited with the mother she thought was dead. They have a few days together, and they’re planning to make a new home together with Beryl, and they learn that Amber’s father is still alive. Everything could be perfect. Then, crossing a highway, Amber’s mother is killed. In the process, she saves Amber’s life, but that’s not really much comfort. I don’t think the story gains much from this death. Any points it makes could have been made another way. The warehouse sties of the pink pigs are pretty awful. It’s obviously a miserable existence. The “Bad Lands” are suburban sprawl, with factories, highways, trains, dogs, pig factories, and other horrors. It’s here that Amber’s mother is killed. It’s made very clear that humans are taking over the places where the wild pigs can live and that if the animals don’t stick together, they’ll be in big trouble. The isolationist tendencies of the first settlement of wild pigs will be their undoing. The wild pigs are afraid of “lost pigs”—pigs that were turned out of a settlement and have lived alone. Being isolated from the pig community makes them “crazy” and therefore to be feared. Amber’s mother is a lost pig, and they told Amber she was dead rather than admitting she was a crazy lost pig. When she finds them, her eyes are a little crazed and she won’t talk. The other pigs run from her, but Amber and Beryl sing a song from their childhood and suddenly she gets all better—finding her daughter pretty much cures her. I enjoyed the book, despite the gratuitous death. The illustrations are wonderful and often add to the story, such as when the reader knows that the long-eared creature that frightens Beryl is only a rabbit. The illustrations also make it a good choice for age 8 and up, including reluctant readers, but it raises some issues that kids might find disturbing. With its focus on prejudice and fear as well as the focus on the main characters as food, it’s worth talking about with your kids.